Spill some egg on your iPad while referring to a recipe? Drench your iPhone in your boardshorts while catching a wave? No problem, says LifeProof. Freedom to be a messy chef and surf while carrying a mobile phone or tablet is the mantra of the San Diego-based device cover maker. The company, which skyrocketed from a handful to 200 employees in the past year, made a mark at the 2013 International Consumer Electronics Show in Las Vegas this week. Its deluxe 40-by-40-foot setup at the Las Vegas Convention Center is a far cry from its tiny booth last year that was manned with just five people. This year, an international sales team is fluttering around and a social media campaign lets conference attendees pose with skis and scarves in front of a slope backdrop while holding a LifeProof-encased phone. They can then upload the picture to Twitter. Various stations at the exhibit visualize the elements the case can withstand, such as iPhone 4s shoved into a pile of dirt and an instructional laboratory scene with a scientist plunking the devices in water. LifeProof is kicking off 2013 with an arsenal of new offerings, including a cover for the Samsung Galaxy S3 slated for the first quarter. In addition, a range of iPhone 5 accessories will be released. The goal is to get people to take their devices anywhere, under any conditions. “We try to enable them through accessories we have,” Wegner said. In February, those will include a lifejacket that acts as a floatation device, a belt clip, an arm band and mounts for cars and bikes that fit the iPhone 5. Products will be sold via lifeproof.com and Best Buy. The price points will stay consistent with the iPhone 4 accessories. “There's no reason for us to change it,” Wegner said. While cover competitors exist and were also on full display at CES, including OtterBox, Wegner explained why LifeProof stands out of the pack. "A lot of other companies talk about protection and 'just in case,'" he said. LifeProof, however, frees users to not worry about whether they should shove their phone in their shoe at the beach, he said. “It's really about them doing everything they want to do without having to think whether they have to take their iPhone out,” he said. “Nothing is on there that is there just for the sake of ease of design or whatever,” Wegner said. He whipped out his own LifeProof-dressed iPhone from his jeans to demonstrate. The case is bordered with material to absorb impact, but the central body of the case is sculpted out to make it more wearable. LifeProof's home base in San Diego fits in with the message of the brand, he said. Its residents already have an active lifestyle; the cover enables them to keep up their outdoor hobbies while bringing a mobile device along for the ride. The company is diving into other sectors, including enterprise. Firefighters in Encinitas, for example, are using iPads with LifeProof cases. An outfitted firefighter at the exhibit showed off the latest covers that can withstand heated life-or-death situations. 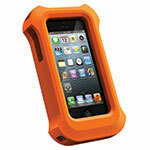 LifeProof's array of bases can lock in an iPod and secure it. “We currently have a major airline reviewing it,” Wegner said. IPad is the device of choice for pilots to view maps with, because of its stellar retina display. “We really try to push enterprise. Medicine, education, first responders, and dirty jobs work. Oil rig work. Construction work,” he said. Products allow Apple devices to compete with rugged computers, like the Panasonic Toughbook. “People love and want to use iOS iPads and iPhones,” Wegner said.